The best word to describe Sahil is definitely masti, or mischief. 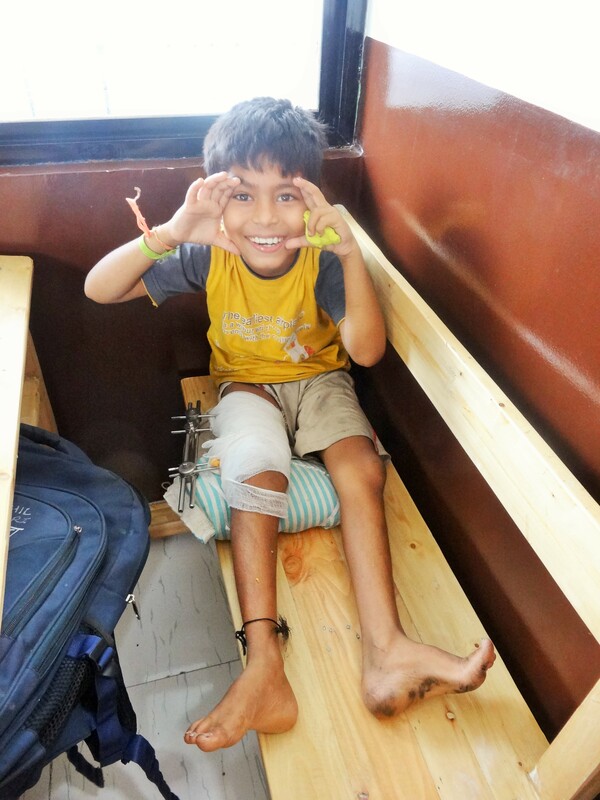 This adorable 8-year-old keeps teachers and caretakers on their toes with his antics, but his love for trouble caught up with him this summer when the wall on which he was precariously balanced collapsed and crushed his femur. He suffered multiple fractures and skin and muscle lacerations, along with a serious puncture wound from a metal rod that pierced his leg when he fell. After the accident, Sahil was immediately rushed to the hospital, where he was met by a team of AIC administrators, health workers and caregivers. This team stayed with his family throughout the evening and into the night as doctors performed emergency surgery to repair his broken bone and torn muscle tissue. Finally, at around 1:30 a.m., the surgery finished. The final tally: 7 stitches internally, 15 stitches externally, plus two large screws and an external rod to support his fragile bone as it healed from the 3 fractures. A week later, Sahil was finally discharged from the hospital with strict instructions on how to keep the wound clean. Sahil’s mother, a widow with another young child, frequently struggles with food insecurity, so the Education and Health Outreach Centres provided both hot meals and basics like eggs and fruit in the first few weeks after he returned home. AIC also gave his mother, a caretaker at the Education Centre, plenty of time off and a flexible working schedule so she could care for Sahil, and we provided counseling and support services for the family as well. All medical appointments, from the initial surgery (where the medicines and anesthesia were bought from the corner medical shop by our on-site director!) to the follow-ups to the dressing changes, were fully covered by AIC’s Health Outreach Program. Finally, the very active Sahil received a rotating supply of books, toys and art supplies from the Education Centre to keep him entertained as he convalesced, and we arranged for rickshaw transportation to bring him to and from the centre so he could continue to study and be with his classmates. Today, about 5 months later, the rod has been removed from Sahil’s leg and he is resting under a doctor’s supervision for another several weeks before beginning his physical therapy to walk again. He has not been able to be in school since the accident, but we are hopeful that he will catch up quickly with the support of the Education Outreach Program. Throughout his recovery, Sahil has retained his good cheer and goofy jokes — he may have a broken leg, but never a broken spirit. Please consider giving to support Sahil and other children like him. Every year, AIC provides vital medical care and supplementary health services to hundreds of children and community members in the Waghri and Sikligar slums. We couldn’t do it without your support!